Even though we aren't going away for Spring Break, that doesn't mean we aren't going to have lots of fun! Today I'm sharing our bucket list of things we have planned to do. My #1 tip would be to be prepared - as long as I'm prepared for each activity, things *should* go smooth. For instance, on the art day, I will already have a craft picked out for them to do and ready to go. I am also taking them to Michaels this weekend to pick out a wooden piece to paint. For the scavenger hunt, I am going to make sure I have everything printed, everyone has a clip board + pens. You get the idea. The point is this, being prepared makes this Mama's life soooo much easier! 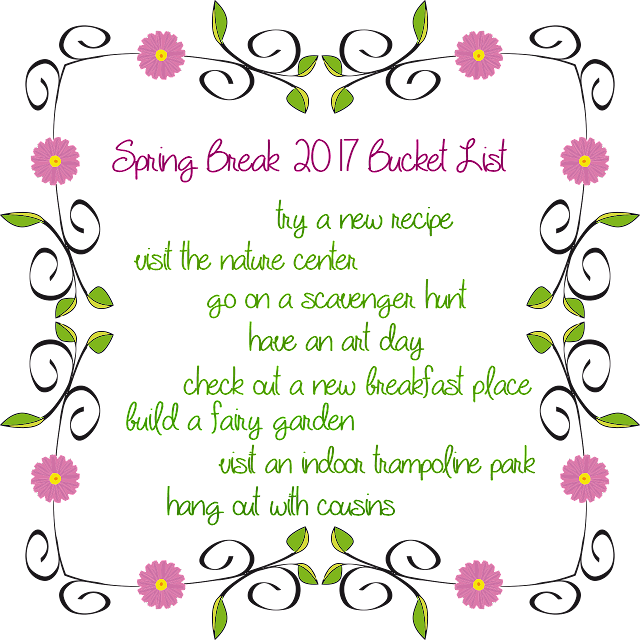 What's on your Spring Break bucket list? Great list and sounds like a lot of fun will be had! I love to try new breakfast spots! Fun list! Bring on Spring Break! So excited for you guys. I know you will find fun things to do and the time together will be amazing. You seem to be well prepared and ready. Such a fun list and I can’t wait to follow along as you cross things off your list. I am thinking about doing a boy version of the fairy garden with Mason. Build a fairy garden? That sounds beautiful! Love having things to look forward to doing in a new season. Spring is my favorite!! Build a fairy garden?! Oh, you better be blogging that because I am really curious to see what that is! It sounds awesome! LOVE your list. Hope y'all have the best time!